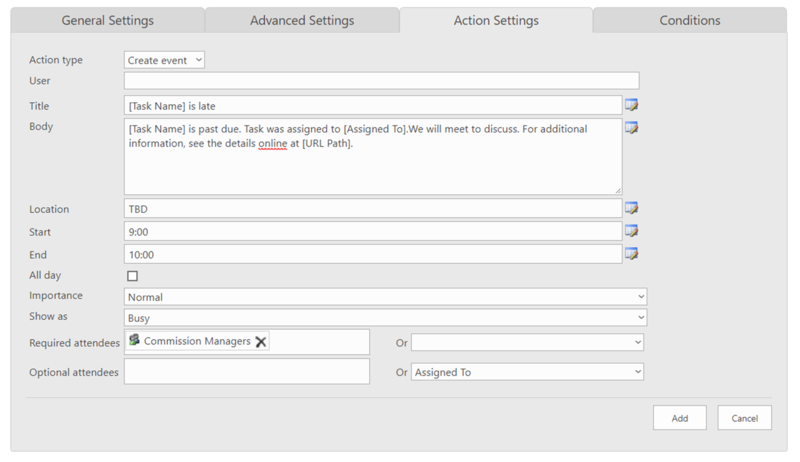 The new Manage Exchange Action allows for the dynamic creation of calendar events based on conditions in your lists and libraries. From your list or library, select the List or Library tab in the ribbon, then click the Infowise “Designer” icon. 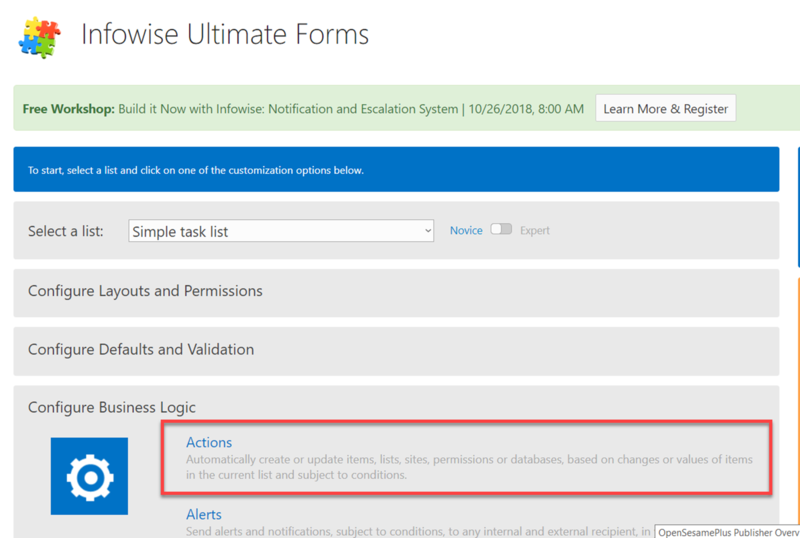 In the Business Logic section of the Infowise home page, select Actions. 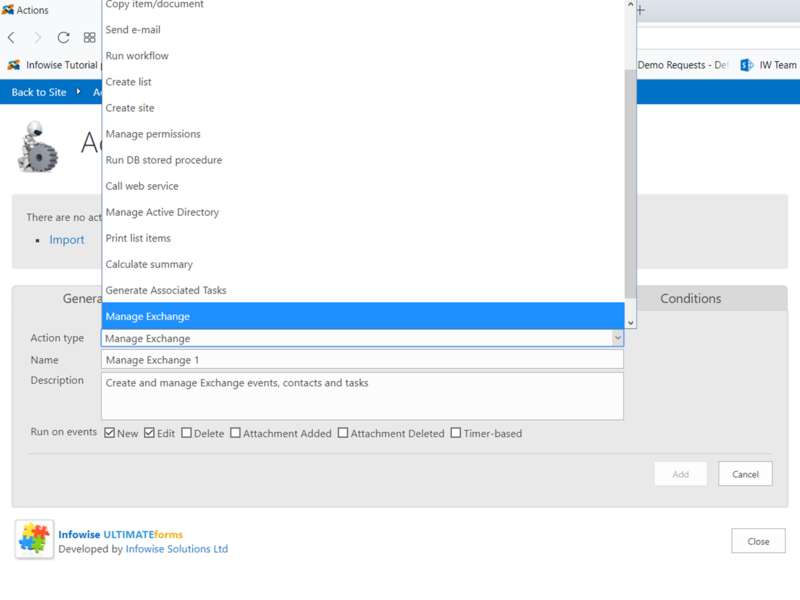 On the General tab, select Manage Exchange as the Action Type. Give the new action a name – it’s also a good practice to add a description. Select when the action will run. On the Advanced Settings tab, you can select to create an icon that will let you run the action as a manual process. You can also choose whether the action will repeat. 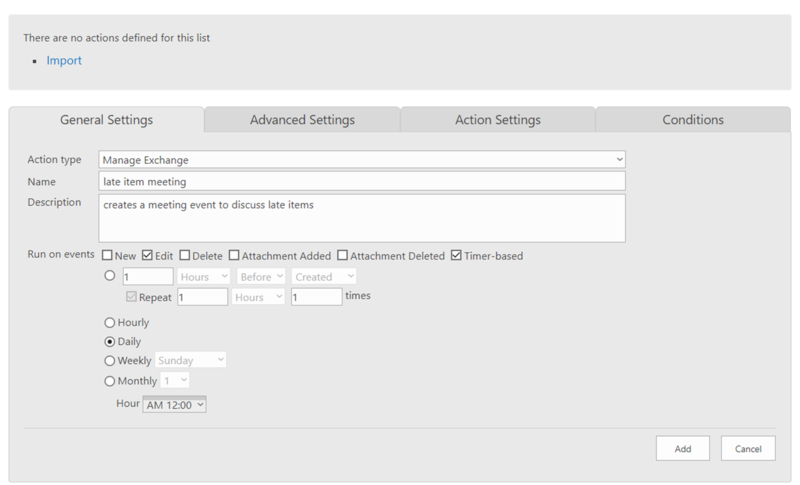 On the Action Settings tab, select whether the action creates, updates, or deletes and event. If you want the event to come from a user other than the creator of the action, enter their email address in the User field. NOTE: entering a different name must be done by someone with site collection admin permissions. Add a title for the event message. You can use the builder to insert information dynamically from the data source. Add the body of the message. Once again, you can use the builder to enter dynamic information from the individual record. Enter the location. If this is part of the data records or a meeting room that exists in Exchange, you can use the builder; otherwise, type in the location manually. Enter the start and end times. Once again, if this is part of the data set, you can use the builder to insert dynamic information, or enter the times manually. You can also mark the event as All Day by selecting the option. Set the importance of the meeting and select how it will show on people’s calendars. Enter the required invitees. You can use names, email addresses, SharePoint or Exchange groups in the first field, or select from dynamic data in the second. NOTE: at this time, you cannot use both the first and second fields and you can only add one recipient as required; additional attendees need to be added as optional. A workaround would be to make sure all required attendees are members of a SharePoint group. 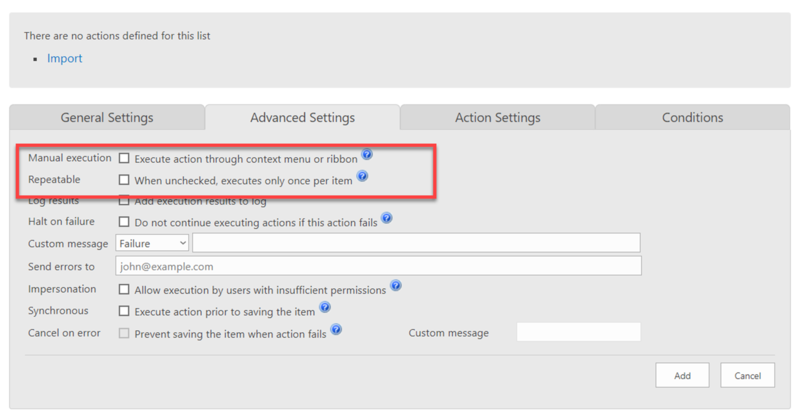 On the Conditions tab, set the conditions under which the action should initiate. When you are done, click Add. The new Manage Exchange Action allows you for the dynamic creation of calendar events based on conditions in your lists and libraries.